The family of the missing Leader of the Indigenous People of Biafra (IPOB), Nnamdi Kanu has cautioned Gov. 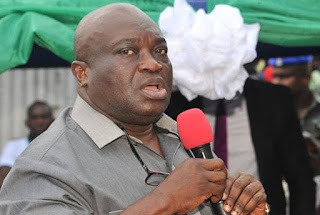 Okezie Ikpeazu not to play politics with the whereabouts of their father and the traditional ruler of Isiama-Afaraukwu autonomous community, HRM Eze Israel Kanu. The warning is coming on heels of a comment credited to Ikpeazu when some people from the community paid him courtesy visit at the Government House Umuahia. Ikpeazu had reportedly told his guests that the state Government was making efforts in collaboration with other South East Governors to ensure that the monarch is re-united with his subjects soon. He also said that contrary to misconception in some quarters, he had no hands in the military invasion of the community during the Operation Python Dance ll. The whereabouts of Eze Kanu, his wife Lolo Sally, and son, Nnamdi Kanu has remained unknown since after the September 14, 2017 military raid on his palace that also claimed scores of IPOB members and Biafra agitators. The family Spokesman wondered why “the Governor who has not thought it wise to visit the family since one year our father, mother and brother got disappeared suddenly made their matter a campaign tool’. He said “Ikpeazu should not think we can be easily deceived by hiring supporters from our community to visit him in Government House and making flowery comments about our family”. He wondered why the Governor would be promising to collaborate with his South East counterparts to help locate the missing monarch only few months to election year. He said Isiama-Afaraukwu community “is the land lord” of the Abia seat of power, and deserves Government sympathy and consolation over the ordeal. His word: “When I heard some people mobilizing to visit the Governor I said I won’t be part of it. Why will I go to wine and dine with him when I have not seen my traditional ruler more than one year the community was invaded by the Army? “Our community is the landlord of the Government House but the Governor has never visited us over our woes. “We have been in pains since after the military invaded us last year. All the houses near Eze Kanu’s palace now have leaky roofs because of the army bullets that rained on them like water. “Since then neither the Governor nor the Federal Government has visited us to know how we are faring. We are victims of the military raid. He said they never had the authorization of the community on the visit and that “whatever they told the Governor was purely their party affair”.